This new AE1 Active model is the first to feature built-in amplifiers. Each loudspeaker features a pair of 50W Class AB amplifiers driving the units, via a 4th order minimum phase crossover, and all fed by either balanced XLR or single-ended RCA inputs. The rear panel has dials for ±2dB adjustments for the 125mm aluminium coned woofer and the 27mm aluminium dome tweeter seated in what Acoustic Energy calls a Wide Dispersion Technology (WDT) waveguide. There’s also a slotted rear port at the top of the loudspeaker. And, aside from a magnetic grille and a choice of finishes, that’s it, really. 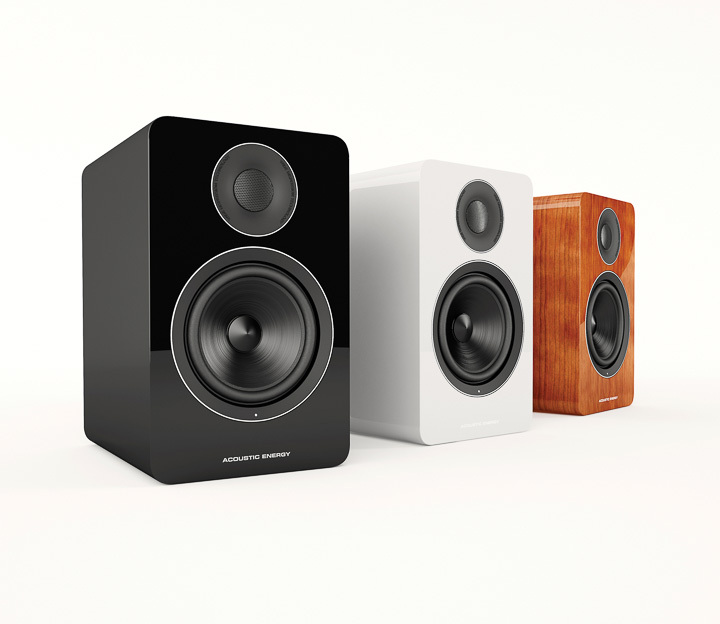 We’ve seen active loudspeakers before, and traditionally they never caught on with domestic listeners. That’s changing, however, especially with smaller two-way standmount designs. The rise of the high-performance, reasonably priced headphone amplifier with line outputs – and the rise of smaller power amplifier modules – has made the affordable active speaker a possibility. The minimalist look of the AE1 Active is very different from the AE1 of old. The simple lines (just a trim ring around each driver, a power light set into the bass cone surround, and the logo) are very modern and elegant, and make many loudspeakers look ‘busy’ by comparison. The magnetic grille and the curved cabinet make the loudspeaker look less intimidating... if you can call a loudspeaker that stands just 30cm tall ‘intimidating’. A pair of matching stands are available, which add about £250 to the package. The way an Acoustic Energy AE1 has to behave falls into very fixed patterns, thanks in part to that long, long history. You could never make a pipe-and-slippers type sound with an AE1 because too many people would complain that you threw out the baby with the bathwater. But, in fairness, that spun aluminium cone and dome arrangement is never going to get you to ‘pipe and slippers’, but there’s a difference between aluminium cones and domes of 30 years ago and the same things today. Back then, no-one really knew much about cone break-up, and still fewer knew how to combat it, so the original AE1 came with a bit of a zing to it, something that was only resolved by using it with behemoth amplifiers. We used to sell them with Naim 135 mono power amps, which were the most powerful thing in the shop, and they weren’t really powerful enough. The fact the new AE1 Active can be driven by 50W Class AB amps shows just how far the technology has come. Partnering the AE1 Active is easy... just pick a good set of sources and a preamp. Depending on the distance from preamp to speakers, XLRs or phono jacks might be preferable. I’d say more than about 5m of interconnect between pre and speaker, go with balanced, and less choose single-ended. In comparison, all other things being equal, I mildly preferred the single-ended option, but the difference was not so substantial as to make it a significant influence in the decision-making process.